The bright, contemporary, Japanese-inspired interior of Gen Sou En. THE LOCALE Gen Sou En opened in February on Harvard Street in Brookline’s Coolidge Corner. The 5,500-square-foot space is a jaw-dropper, blending bright, contemporary aesthetics with traditional Japanese features. It’s awash in light woods and includes curving shelves displaying tea and brewing accessories for retail sale. In the center, beneath a skylight, is a tree that confers a sense of calm even amidst the crowds lined up to place orders at the counter before searching for seating. 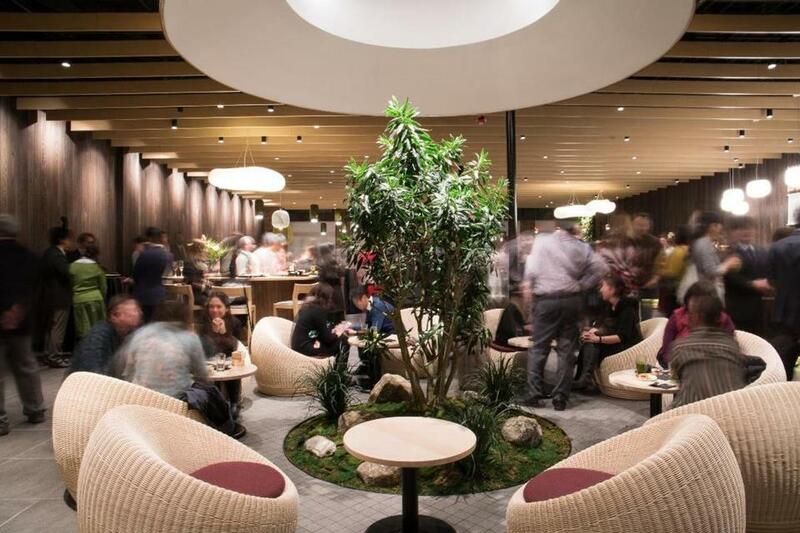 The 160-seat space has everything from regular tables to woven pod-shaped chairs to a sectioned-off tearoom adorned with tatami mats. ON THE MENU Having previously visited Japan and harboring a not-inconsequential love for all things matcha, I found Gen Sou En’s menu especially gratifying. “The cool thing about matcha is you’re consuming the full tea leaf and getting all those great nutrients. It’s very cleansing,” Gocka said. The bakery proffers matcha cream puffs, matcha-infused sponge cake rolls and roasted green tea cookies, all tinted a glorious shade of (you guessed it) green. Pastries pair nicely alongside different profiles of green tea: mellow and savory umami; strong and intense shibumi, and deep and complex kokumi with a long finish. “People say, ‘The green tea is really green!’ That’s why we serve it in a clear mug,” Abe said. Our umami selection (large, $4) is a bright, satisfying quaff. Once a month, the teahouse hosts full tea ceremonies during which guests sit on the floor and traditional foods are served alongside specially selected teas. For those craving more than tea and pastries in the morning, there is a traditional Japanese teishoku (meal set) featuring boiled salmon ($10). The set concept extends to lunch and dinner; we ordered the braised beef brisket kakuni ($16), which was arrayed with ginger-topped white rice, miso soup, and pickled vegetables. We also tried the miso-eggplant katsu sando, or sandwich ($9), which layered panko-crusted and fried eggplant slices with slaw and tonkatsu sauce between slices of shokupan, a light, fluffy Japanese milk bread. The miso latte ($6), espresso and milk faintly imbued with the taste of fermented soybean, is fun to try. “I love miso soup, but I had never thought about milk and miso together,” Abe said. The teahouse plans to unveil other unique beverages, and just rolled out several bubble teas. 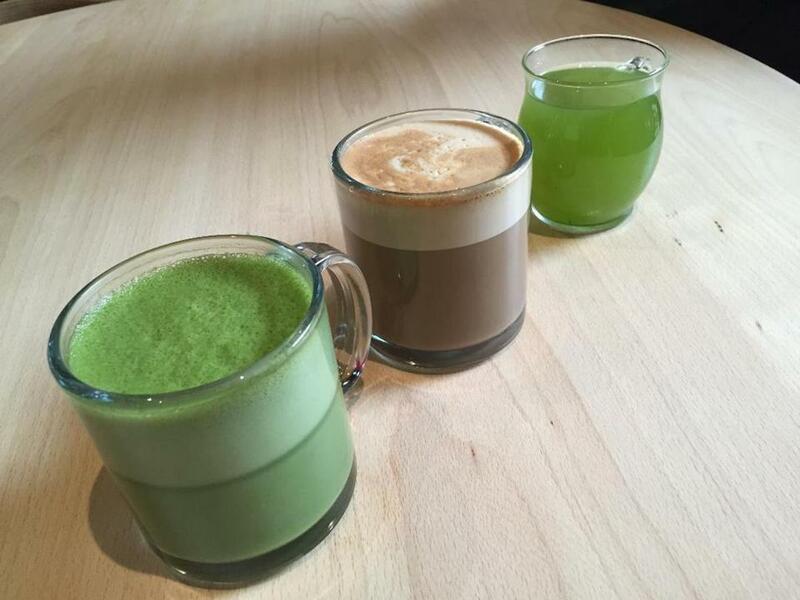 Already, its matcha tea latte ($5), available both hot and cold, is a best seller; the infant in our party even tried to sneak a sip. Gen Sou En’s menu will continue to evolve. “In Japan, there are many seasonal items, with certain regions of Japan having specific flavors,” Abe said. For example, “during springtime, we are very proud of our sakura, our cherry blossoms,” so in addition to an already available sakura soda crafted with made-in-house syrup, the teahouse plans to serve sakura bread and other such items. My visit to Japan occurred during sakura season, and I remember fondly the array of cherry blossom comestibles. For something a bit closer to home, Gen Sou En is a very welcome destination. Gen Sou En Tea House, 299 Harvard St., Brookline, 617-505-6745, www.gensouenteahouse.com. 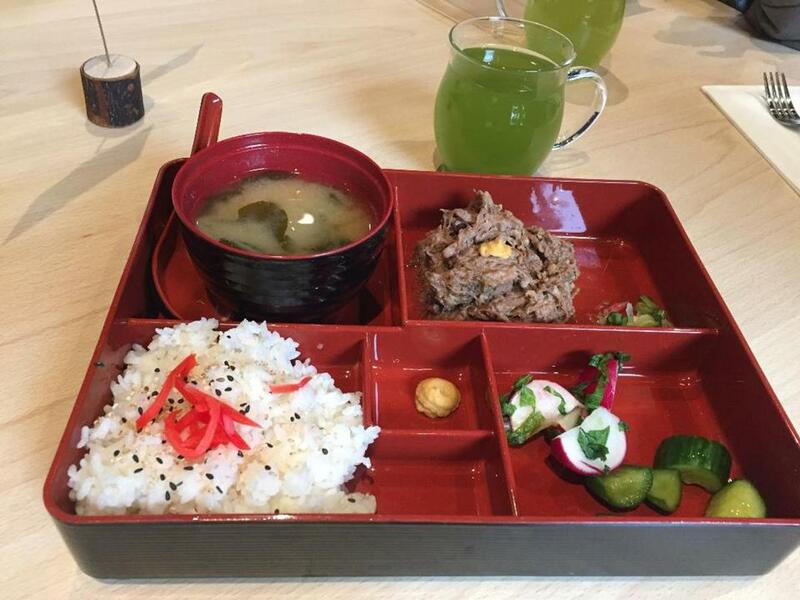 The braised beef brisket kakuni set with white rice, miso soup, and pickled vegetables.